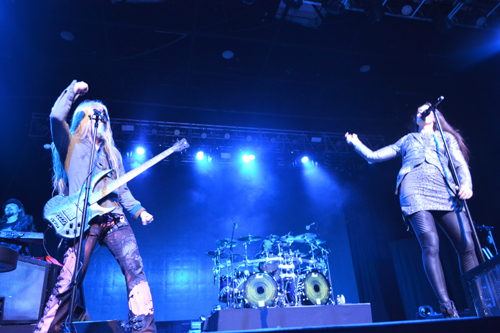 KNAC.COM - Reviews - NIGHTWISH In Dallas With Photos! 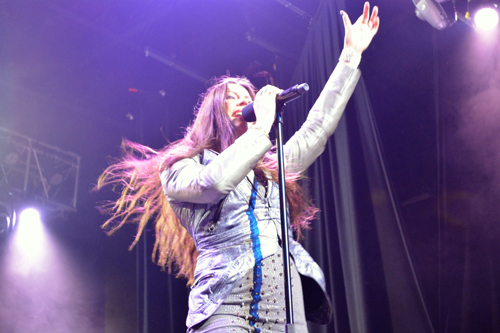 NIGHTWISH In Dallas With Photos! 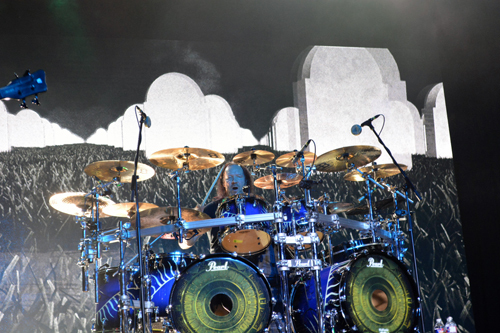 NIGHTWISH live is a spectacle to behold and their recent North American Tour in support of their Decades greatest hits compilation was nothing less than grand. As the band treks on to their European dates, fans in the United States are still talking about how truly wonderful the band is; as positive reviews from across the country pour in, I read them and remember the first time I saw them and provided press coverage for their first tour in 1997. Decades is a comprehensive album that covers each incarnation of the band; most notably the changes in female vocalists. 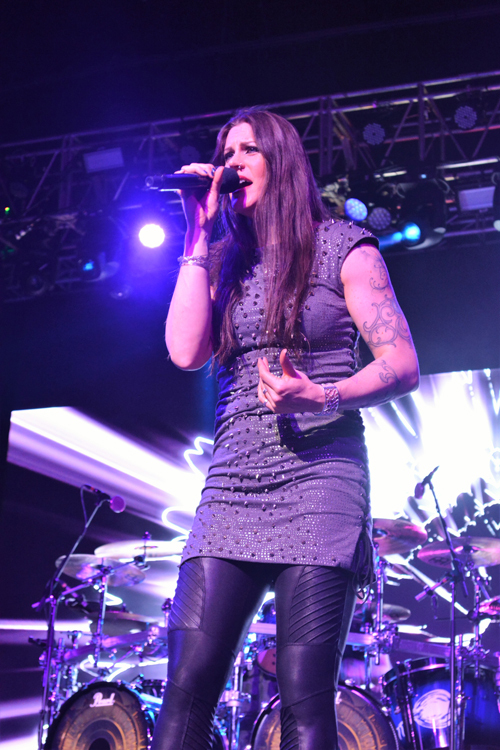 NIGHTWISH is a band that has set the standard for numerous other symphonic Femme Metal acts. It began with Tarja Tarunen, crossed over to Annette Olzen, and is currently in play with powerful frontwoman Floor Jansen. 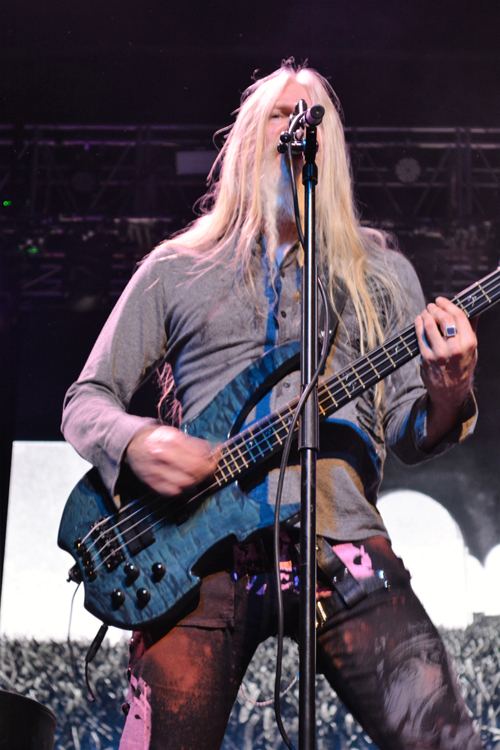 The rest of the band is comprised of founder and keyboardist Tuomas Holopainen, guitarist Emppu Vuorinen, drummer Kai Hahto, bassist and male vocalist Marco Hietala, and uilleann piper Troy Donockley. 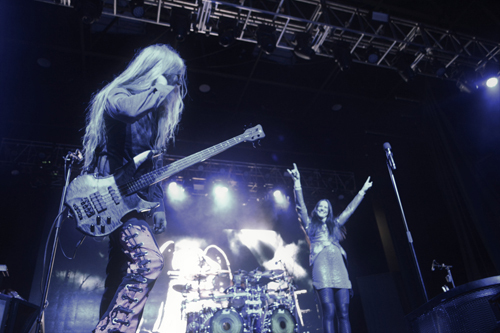 The tour itself was as closely integrated with the album material as possible and the two hour show in Dallas at The Bomb Factory only featured NIGHTWISH. There was no local or national support act on the tour. It was all NIGHTWISH, all night long. The show featured an instrumental folkish intro by Donockley and smoothly transitioned into “End of All Hope”. Without missing a beat they seamlessly moved into the ever popular “Wish I Had An Angel”, “10th Man Down” and “Come Cover Me”. Holopainen has always followed a formulated songwriting strategy that includes influences from fantasy books, movies and original stories that he writes himself. The music is ethereal and each album follows a theme. While the songs performed were mixed, it was noticeable that in some cases they were loosely structured by the album on which they originally appeared. “Gethsemane”, “Elan”, “Sacrament of Wilderness” and “Deep Silent Complete” were next in the set list, intermittently disbursed with audience interaction by vocalist Jansen. Jansen has been a full member of the band since 2013 after a controversial parting of ways with Olzen, but it is clear that the band has grown musically and their stage show has morphed into something more powerful over the past six years. I have had the pleasure of seeing them with each of their singers. While many fans were shocked at the controversial firing of Tarunen, and less surprised by the dismissal of Olzen, they have firmly embraced Jansen as she superbly performs music from each era of the band’s music. The show continued with “Dead Boy’s Poem” and then Donockley returned to the stage to solo in traditional folk metal style with pipes and strings and was rejoined for “Elvenjig”, “Elvenpath”, “I Want My Tears Back”, “The Carpenter”, “The Kinslayer”, and “Devil & The Deep Dark Ocean”. 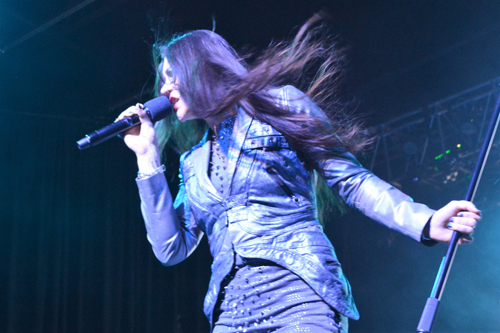 Jansen is a ferocious frontwoman with an impressive presence onstage that outshines her predecessors. Having been able to compare the three women, she does come out ahead both vocally and with her command of the stage. As the first strains of “Nemo” filtered through the room, the audience’s energy reached a fever pitch. This song is the beginning of the end of the show as it moves into “Slaying the Dreamer”, the incredibly lengthy “The Greatest Show On Earth”, and finally for the closer, “Ghost Love Score”. It was a truly magical performance from an experienced, professional and superbly produced band. Additionally, fans, press and venue employees had an excellent experience due to the highly professional tour management lead by native Texan Roger Smith. His experience as a tour manager is evident in the way the shows throughout the tour ran on time and were excellently produced. In closing, I would also like to say that Nuclear Blast Records included a value added incentive to fans because every single person who came through the door of The Bomb Factory that night was presented with a copy of Decades; it was a tangible “thank you” from the band and the record label. If you have never had the opportunity to see the band live, you must see them when they next come to the U.S. It is very much The Greatest Show on Earth. Check out a few other photos from the show!